Fighting for one of Wales' oldest piers Jump to media player Alternative funds are needed to repair Garth Pier which is thought "a danger to the public". End of the pier as demolition completed Jump to media player Demolition work on Colwyn Bay's 116-year-old Victoria Pier has seen the fine piece pulled down after a project that began in January. Historic piers face uncertain future Jump to media player At the turn of the last century, there were almost a hundred piers in Britain, now only half remain and many face an uncertain future. Bangor pier overhaul cash concern Jump to media player One of Wales' few remaining Victorian piers is facing a potential £1m shortfall in cash needed for vital work. When Beatlemania came to Bangor Jump to media player Fifty years ago the Beatles arrived in the Gwynedd town of Bangor - where they found out their manager had died. Baby seal rescued from N Ireland rocks Jump to media player The Coastguard rescued the pup which is now being cared for by vets at Exploris Aquarium in Portaferry. How much does it cost to mend one of Wales' oldest piers? 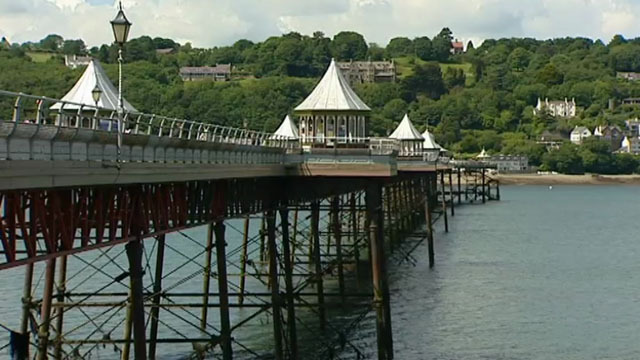 One of Wales' oldest Victorian piers is in need of alternative funding to pay for repair work. Restoration, paid for by Bangor City Council, has been ongoing for two years. But engineers said the furthest part of Garth pier was "a danger to the public" and it needs an extra £600,000 to be fixed. Garth councillor Huw Wyn Jones said: "We must make sure it's here for generations to enjoy in future."